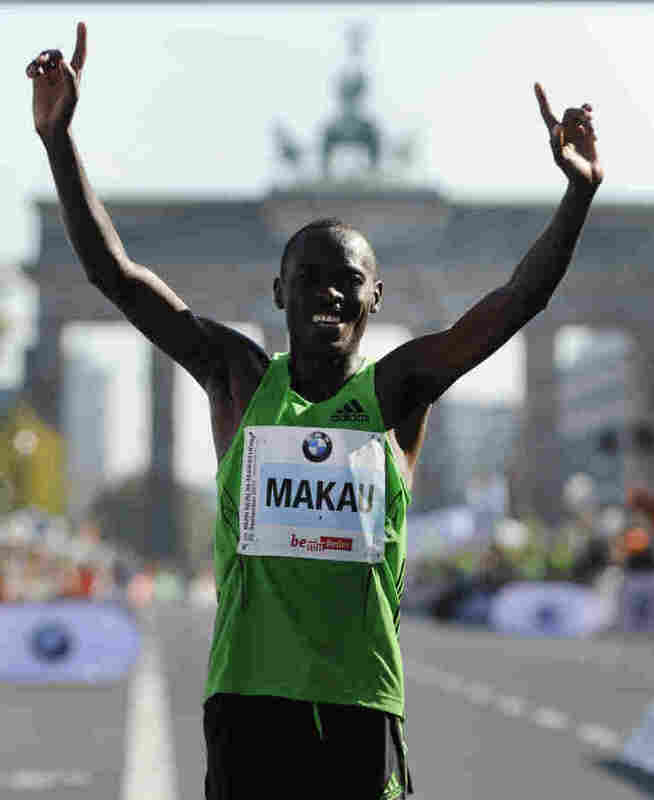 Marathon Record Lowered By 21 Seconds : The Two-Way Kenya's Patrick Makau averaged about 4 minutes, 43 seconds per mile over the 26.2-mile course in Berlin. The previous record holder, Ethiopia's Haile Gebrselassie, had to stop because of exercise-induced asthma. Patrick Makau of Kenya celebrates in front of Berlin's Brandenburg Gate after setting a new world record for the marathon. Kenya's Patrick Makau ran the Berlin Marathon on Sunday in a new world record time — 2 hours, 3 minutes and 38 seconds. He shaved 21 seconds off the previous record, set by Ethiopia's Haile Gebrselassie on the same course in 2008. "It is great to see a new generation and I would love to race them for some time." Makau's per-mile average time, by the way, was about 4 minutes, 43 seconds. Makau, appropriately enough, is 26-years-old. Earlier this year, the BBC asked experts whether a marathon will ever be run (on an approved course) in less than 2 hours. Gebrselassie was among those who said yes, but that it might take another "20 to 25 years" before that happens. Others, though, say the limit may be around 2 hours, 2 minutes. One hundred years ago, the record was just under 2 hours 40 minutes. Do you think the marathon record will be lowered below 2 hours during your lifetime?